Algarve Yacht Birthday Cruises are the best way to celebrate your Birthday along the beautiful Algarve Coastline, departing from the Vilamoura Marina! We provide the finest Private Yacht Cruises for your Birthday! 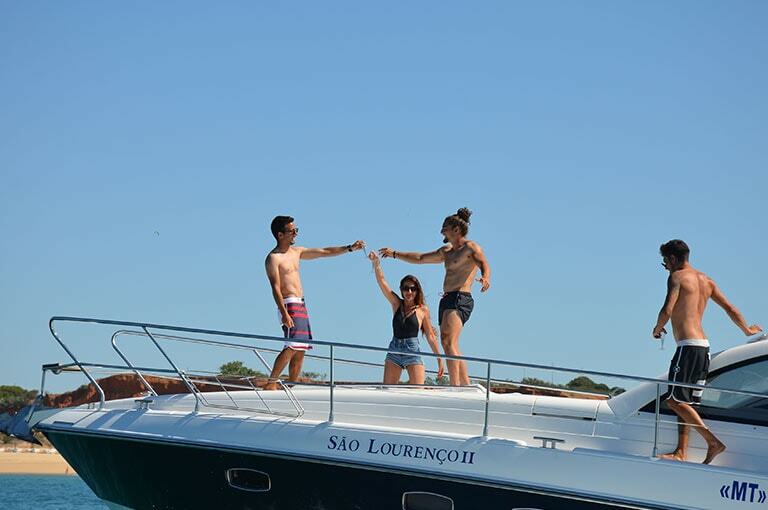 Algarve Yacht Birthday Cruises are the perfect way to celebrate your Birthday in the Algarve! Here at Champagne Cruises Vilamoura we offer luxury Cruises with unlimited champagne on board and other drinks included. Celebrate your Birthday in a private, luxury environment! Our Algarve Yacht Birthday Cruises can be tailored to groups of all sizes and attend to your special requirements. Enjoy your Birthday celebrations on one of our stunning Algarve Yacht Cruises! Luxury Anniversary cruise in the Algarve – Portugal, join us onboard one of our private yacht cruises it’s simply the best way to start new memories on your wedding anniversary sip champagne on our luxury cruise. Celebrate your anniversaries, birthday’s and, or any other celebrations here at Champagne Cruises, with champagne always on the menu! You are certain to have a most amazing cruise along the Algarve Coastline. Interested in booking your Luxury Boats Charter with us? Please contact us for reservation details. Was walking around the marina and saw their 3 stunning yachts located on the A pontoon , called the number on the back of the boat on the banner and enquired about the prices as thought spending my birthday out on a luxury yacht might be something fun and a little different. The boat we took was called Atlantis and it was brilliant fun , the skipper on board Nunu was brilliant he was very attentive and made sure we were having a great time . Great idea for a way to celebrate a birthday in Vilamoura . See you next year ! Please leave us a review on TripAdvisor & Google+ to help other guests in making informed decision when renting a Boat Charter in the Algarve. Thank you! If you are looking for more information, please visit our FAQ’s, Sitemap or Terms & Conditions. Follow Luxury Boats Algarve on Facebook! Visit Luxury Boats Algarve on Social Media!